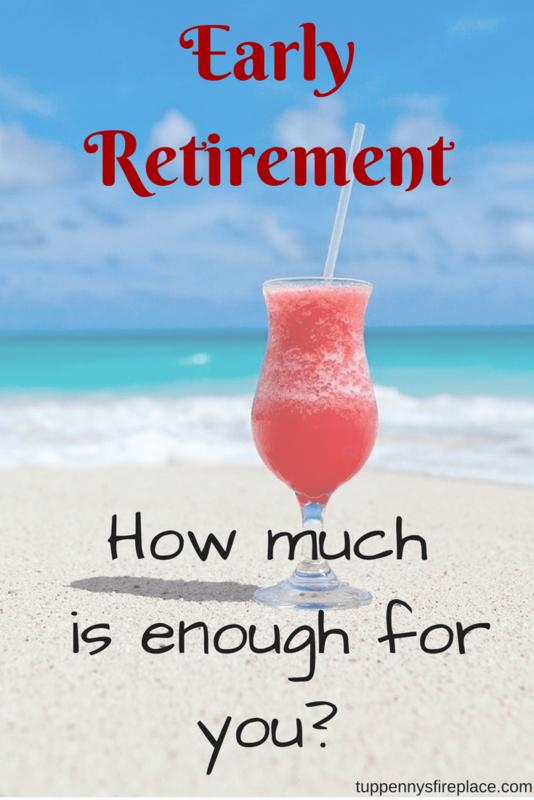 Early Retirement - How much do you need? You are here: Home / Life / Retirement / Early Retirement – How much do you need? 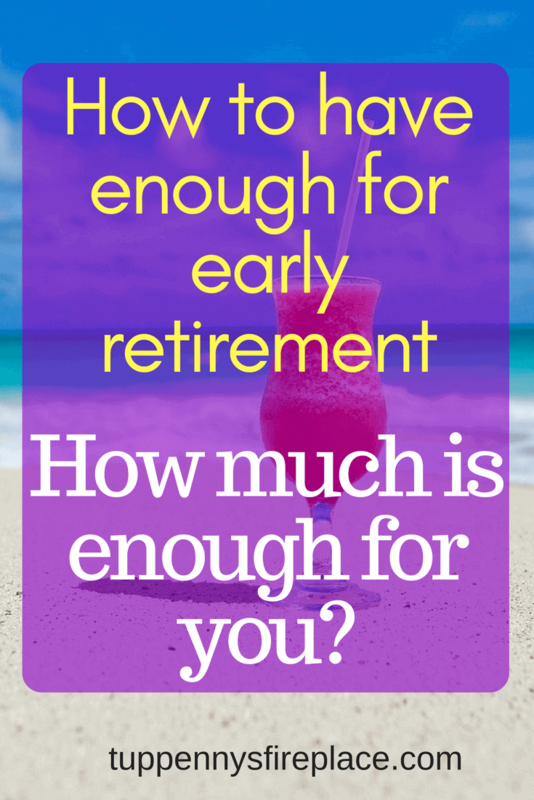 Early Retirement – How much do you need? Mr2P and I are planning our early retirement for our early 50’s as we will have enough money to do so. But we don’t have anything like a million pounds in savings. Our enough will allow us to live quietly and fully without working. We will have enough, not because we earned a lot but because we saved a lot. Our enough may not be your enough – your enough could be more or less than ours; it’s certainly nowhere near my brother’s enough. But our enough is enough. 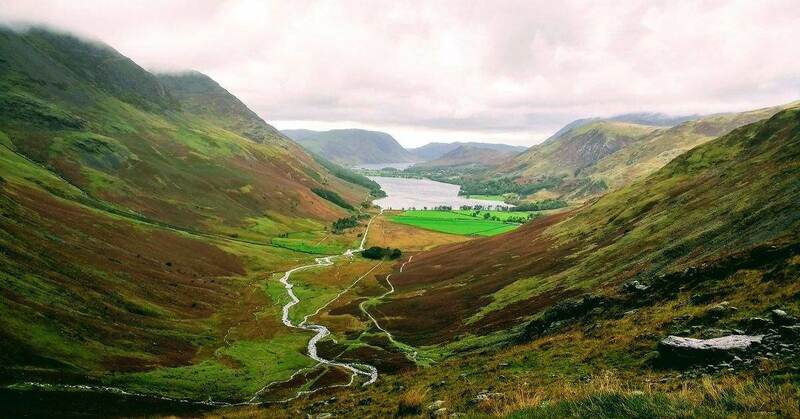 Our enough will allow us to swap our house in Hampshire for one in Cumbria with a bigger garden, to run and replace a car every 6 ish years, to take a holiday or two in the UK and most importantly, not have to work! The not working part is optional because you just never know if something comes along that you want to get involved in. Our enough will allow us to commence our early retirement before our state retirement age of 67 because we will have enough money to live on before those pensions kick in. We can do this because we have chosen to live without the latest gadgets, without full cable/sports packages, without regular beauty treatments (Mr 2P cuts my hair). These are things that don’t float our boat so why spend our money on them at the expense of saving to finish work early? It won’t pay for 2 holidays abroad but that’s ok because we aren’t planning any. It won’t pay for a brand new car every 3 years but we’ve never had one of those or changed our cars that often. We have enough for what we need but many of our things are not the latest style. For example we both have laptops but we bought refurbished. We have had them long enough for both to need new batteries. What we won’t be doing is buying a new laptop, this one works fine thank you very much! In our younger years we definitely lived to our means (and beyond at times). When your mortgage rate is 12%, you have full time child care to pay for and 2 cars it’s very hard to save any money at all when you don’t earn much. We couldn’t afford to have the heating on for long when we first got that 12% mortgage and certainly didn’t have holidays abroad. 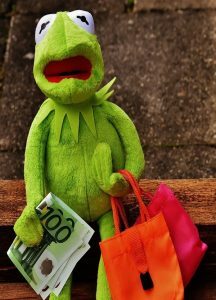 When you are working hard and seeing all your money go on bills it’s very easy to think about treating yourself because you deserve something in return for all your hard work. Family trip to the cinema – because that is what other families do, right? Having splurged on that first pay day weekend we then had little money left for the rest of the month. Needless to say we weren’t saving any money then! As we slowly thought about what we wanted for our future we realised that perhaps what we deserved was to move to the country, to work less, to chose when and if we worked. And if that is what we deserved, treating ourselves by buying stuff every month wasn’t really a treat was it? Those treats were getting in the way of what we deserved. Building our enough pot by saving money every month became our treat. When I got a promotion at work I decided that I didn’t need to spend more. I felt I deserved to put all of my extra salary into our savings, indeed it’s one of the reasons why I went for my last 2 promotions, chasing the money to increase our savings and my eventual pension. Don’t get me wrong, we still buy ourselves treats, they are just not expensive treats and they are not at the expense of our savings. Our go-to treats are white chocolate (me!) and chilli peanuts (Mr2P) but not simultaneously! The more you spend, the more money you need to earn and the less you are able to save. When you stop working you need more money to continue to live in the style you are used to. Conversely, the less you spend, the less you need and the more you can save. For over 12 years we have not spent all our wages, we have not allowed lifestyle inflation to creep into our spending. Lifestyle inflation is when your lifestyle increases in cost to keep pace with your earnings, living paycheck to paycheck. 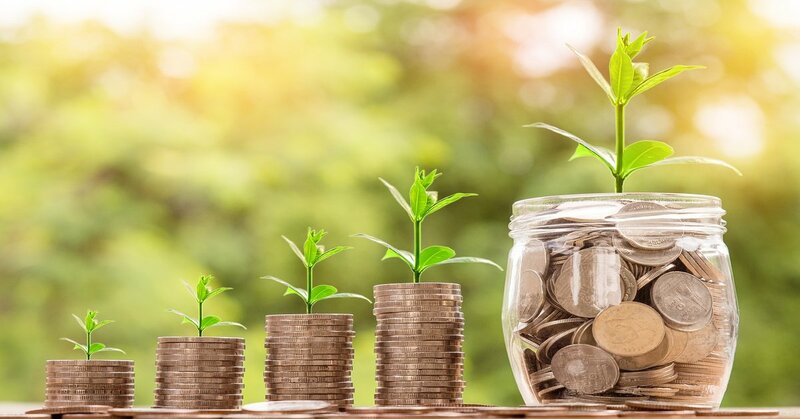 If you want an early retirement, or switch to part time work, or maybe start your own business then start building your enough pot because you deserve it. You deserve to have these ideas and you deserve to spend your hard earned money by treating yourself and help make them come true. Start treating yourself by saving a little every week/month and watch your enough pot grow. We have almost achieved our enough now although we continue to work and save for a little while longer. Every penny we save helps our savings grow that little bit more. Our enough is not your enough and is nothing like a million pounds but it will get us what we want and when we want it which is nearly now. Mr2P’s chilli peanuts are not going to stop our dream from becoming a reality! Do you know your enough? Have you changed what see you see as a treat over the years? Do you spend less than you earn? Could you make small changes to save more? Follow me on Pinterest for more money saving hacks and frugal tips! Good luck with not only the blog but of course the FIRE – I’ll be reading with interest to see how your journey evolves and any tips I can bring to my own FIRE journey. But even FIRE should not get in the way of a man and his chilli peanuts !!!! Mr2P will be grateful someone agrees with him! Hey there! Greetings from the forums! This is a really good about me post… I might try some things you mentioned when I re-work my About Me… I like the idea of an “enough.” That can get blurry in the world of multi-million dollar FIREees. Your site loaded quickly and I see you have some fotos here. Who hosts your site? I am having trouble with slow load time on mine. Yeah I wanted to make clear we are not in the million dollar bracket by any means. I’m with Siteground. Recommended by quite a few of the ‘serious’ bloggers. Great support for us non-techy’s. I shrink my photos before I upload them – none more than 150kb – another rec I got. Feel free to email me if you have any other questions – happy to help! Thanks for stopping by Joleisa – nice to see you here! Thank you for your feedback. You’ll have time I am sure when your teens are no longer teens. Love all the crafty things you do with the kids. I was never great at crafts with my girls so always really appreciated the people who organised holiday craft events. I’m ok as long as I have adult supervision!! I love this – I have a good idea of what my ‘enough’ is but I was initially disheartened when I saw that so many others were saying they needed at least a million in the bank before they had enough or were near enough. That made me doubt my own numbers, thinking that perhaps I’d set a ridiculously low target which would have me living in poverty and regretting retiring early! But no, like you, my enough doesn’t require a million (or even half a million) because of how I live my lifestyle. The number has changed since I first set it, to try to account for lean or fat FIRE. Anyway, congratulations on being on the cusp of your enough ! The 4% rule was also disheartening for me as we won’t have the luxury of only spending dividends. We will be spending down our capital as we’d have to work another 10+ years to be able to use the 4%. On the upside I will have a reasonable final salary pension and Mr2p has a smaller one. With DB & DC pensions there is less need for the millions in the bank and/or the 4% rule. I won’t be using the 4% rule either because like you , I can’t save enough to just live on the dividends , so I fully intend to spend down my capital – with my DB pension, I’m in a similar position to you. Even if I were to spend every single penny (I hope not to! ), by the time I’m 67, the DB pension and the state pension combined is pretty much my lean FIRE annual number. That’s great that you are comfortable with spending down your capital. After all, why save it all and then not spend it? I have kids but I didn’t scrimp and save in order to pass on my capital to them. Hopefully there will be some left as I plan on keeping a chunk as an emergency fund/capital spends pot. I hope your plan includes topping up your NI contributions when you do FIRE to ensure you get the full state pension? I think I’ll need to buy 4 years. I only learnt that little tip 18 months ago – makes a big difference when I hit 67 though. A million pounds in the UK (obvs) is a pretty fatFIRE I think. That’s £40,000/year according to the 4% rule!!! Depends on where you live and/or whether you have paid off your mortgage but assuming you have the latter, and even lived in a relatively high COL area such as the south east where I live, that is way more than we are spending right now (excluding our mortgage, and even slightly more including it). Geographical arbitrage is a great way to hit FIRE even earlier, and works spectacularly well even if staying in the little ole UK. Obviously you have to be living in a higher COL/earning area in the first place to make that work though. Would be interested to see some actual figures on what you intend to buy, expected cost of living… and so on? Cheers and good luck for the final push! Hi TFS, been reading your blog almost since you started! Not got as far as actual figures yet, especially as I am not good on spreadsheets! £40k is very fatFIRE for us and way more than we spend too. We don’t have a mortgage so living expenses is what we need. The 4% rule won’t apply for us as we will mainly, once hit 55/58 be relying mainly on DB pensions (we are very lucky) with a SIPP thrown in. In between time we will draw down on savings. We will be using geographical arbitrage not to spend less on our next house but to get more for our money in what we would consider a nicer location. Keen to have a large garden rather than garden + allotment 2 miles away. That’s the plan anyway! I agree with TFS – £40k in the UK feels like pretty Fat FIRE. It’s good to read more from people with the UK perspective as I was also getting disheartened by the massive numbers I was reading elsewhere. This is a great perspective and one I wish more people had. I genuinely feel great when I’ve saved a high proportion of my salary – it feels like I’m treating myself far more than if I were to go and spend it on things. Hi FIREthe9to5 – love your blog name and your countdown clock! FIRE is all about having a different mindset. The Joneses mindset is buying yet more stuff as a treat. Buying myself freedom at an early stage is my treat, and yours too. I can’t imagine earning £100k never mind fatFIREing on it which is the latest trend to be talked about. But that’s ok, I shall just do my own thing. There are more and more of us starting to come out of the woodwork it seems which feels good, safety in numbers and all that!